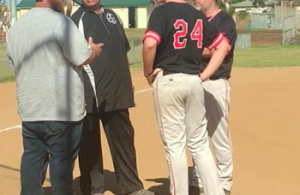 RANCHO SAN DIEGO (4-12-2019) – The East County softball home run race may be heating up, but there are other elements which are equally deep with talent this season. One of those spots are an array of top leadoff hitters. One of a half-dozen talents is Steele Canyon shortstop Jessica “J.J.” Venzor, who seems to post a career day at the plate almost weekly. On Thursday (Apr. 11), the Cougars’ senior co-captain made a splash with another game-winning hit, clearing the bases with a 3-run double to open the scoring to help defeat Rancho Buena Vista, 5-2. A 4-run outburst in the 2nd inning was keyed by Venzor’s two-out double to center field. Venzor then scored on an Audrey Bagge base hit. And when the Cougars scored on a double play in the 3rd, the 5-0 lead was more than enough for winning pitcher Grace Richter. The senior tossed a 5-hitter with both runs coming unearned. Normally, the leadoff batter is responsible for reaching base and scoring runs, which Venzor has done with 17 markers. But she’s also reached double-digits in RBI, helping the Cougars (9-9) to win four of their last six to finally attain the 500 plateau. Venzor has also been solid on defense, be it at shortstop or third base, charged with just four errors at one of the busiest spots on the diamond. Rancho Buena Vista (6-6-1) scored its run in the 4th, receiving by cleanup hitter Kaylee Hull, a third baseman, then an RBI single by pitcher Farrah Steffany. FOOTHILLS CHRISTIAN 11, TRI-CITY CHRISTIAN 6: At Foothills Christian, the Knights broke a first-place deadlock with the visiting Eagles for the leadership of the Pacific League by posting a come-from-behind triumph. Down 5-2, Foothills Christian tied the game in the 3rd, but when Tri-City answered with a run in the 4th to re-establish the advantage, the Knights posted six unanswered run to drop the Eagles into third place; Orange Glen sits in second, just a half-game back. The heart of the Knights batting order accounted for seven of the ballclub’s eight hits. Included was a 3-for-3 outing by Kaylee Guler, who also walked and scored four times. Guler was surrounded by Sheyenne Boubion and Carly Robbins, who both went 2-for-4. Down 6-5, a 4-run rally in the 5th spelled the difference. Foothills loaded the bases when Guler slapped a lead single, Robbins reached on a bunt with the throw too late to get Guler at second base then Shanel Boubion walked. Holli Johnson followed with a squeeze bunt, but little did she know she would score on a strange play. A throwing error saw the ball “roll forever” by playing on a field without an outfield fence, as all four players scored on the unorthodox 4-run play; Johnson, at least, received a sacrifice bunt. For Foothills Christian (9-2 overall, 5-1 Pacific), Johnson registered two RBI. Also, student support was limited as FCHS just started a 3-week long spring break. Tri-City Christian (4-6, 4-2 league), located on the western edge of Vista next to Oceanside, saw right fielder Mika Letuligasenoa bat 4-for-4, collecting half of the Eagles’ eight base hits. 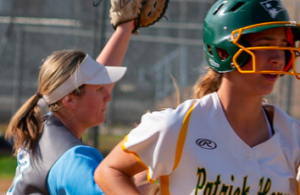 PATRICK HENRY 11, SD-HIGH TECH 1: At Liberty Station, Hailey Jenks and Olivia Giganti combined to toss a 2-hitter, pacing the Patriots in a non-league game against the Storm. Giganti and Savannah Sutton, both freshmen, each belted home runs to lead an 11-hit attack. Both homers came in the 3rd. Edie Guthrie capped the contest by doubling home both Maya Dickerson and Jessica DeWitt to invoke the run rule in the 5th inning. Four runs in the 1st decided this contest quickly. The key hit was Guthrie’s 2-run double, bringing home Lauren Nett and DeWitt. Four additional runs in the 3rd made it 9-0, as Giganti’s 2-run homer was her sixth of the season. She batted 3-for-3 with five RBI and scored twice. For the Patriots (12-2), Dez Patman had two hits with a triple, Kaiah Altmeyer had two hits with a double, while Guthrie collected two doubles. SD-High Tech (4-7) avoided the shutout when Rachel Warrens hit a two-out double in the 5th. POINT LOMA 9, CHRISTIAN 8: At Roma Dawson Field in El Cajon, the Patriots rallied with three runs in the bottom of the 7th inning, with the potential game-tying run on third base with one out, but the visiting Pointers registered a pair of groundouts to escape with Thursday’s (Apr. 11) Eastern League decision. Mallory Steele capped a 3-for-4, 3 runs scored performance with a lead double, as the bases became loaded when Cali Rookey was hit by a pitch and Audrey Shebloski (3-for-4) singled. “Mallory has been doing really well at the plate lately for sure,” Shebloski said. “I feel like we could have and should have won today’s game but our inexperience cost us today with a few key errors. Eliminate those errors and we win today’s game. Devyn Krystek intentionally ground out to the right side to bring in a run, then Kate Manes clouted a 2-run single to trim the deficit to a single run before Point Loma survived. At mid-game, both Steele and Krystek homered in the 5th for Christian. Steele lifted a leadoff shot into the eucalyptus trees in right field. Krystek later drilled a 2-run liner to center to move the Patriots to within 6-5. The Pointers answered with three runs in the 6th, which proved important when Christian posted three in the 7th. For Point Loma (8-8 overall, 2-0 Eastern), designated player Taylor Riley batted 3-for-4 with a double and three RBI. Christian (2-11, 0-2 league) dropped its 8th straight. “Pitching is definitely a struggle but even though the score did not show it, I believe that Kate (Manes) pitched really well as she was ahead in many at-bats, just some were unlucky,” Shebloski said. We are pushing through! And do u know where i can find the podcast that you told me to check on tuesday? GOMPERS PREP 19, EL CAJON VALLEY 0 (4 inn. ): At ECVHS, Thursday’s (Apr. 12) non-league game featured the return of former Patrick Henry High assistant coach Scott Hernandez, who is now in his sixth season guiding the Eagles of Chollas View. 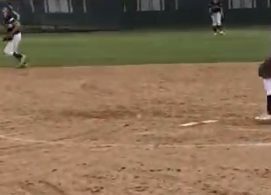 Behind a 3-hit shutout by junior Linda “Five Fingers” Velasquez, Gompers Prep (4-8) completed a season-series sweep of the Braves 0-12). Earlier, the Eagles posted a 14-2 victory on Apr. 2 at their new home field at Oak Park Recreation Center.